Pioneers in the industry, we offer cdma gateway, analog gateway, voip gateway and gsm gateway devices from India. For Best Dialing Efficiency: With high-accuracy call classification features, SR500 (500Chs) enables solution providers to maximise efficiency and minimise OPEX in a variety of outbound dialling systems, including Predictive Dialling, OBD, Call Center, Telemarketing, etc. Detect Any Phone Status for Best Efficiency: To maximise dialling efficiency and deliver intelligent system, call classification functionality helps dialling customers detect and lock on valid calling numbers for hi-accuracy and hi-density dialling, via avoiding “invalid” numbers in “shut down, suspended, unused number or any unavailable” status. Improve Dialing Efficiency by up to 60%: In the general database of OBD systems, unused numbers accounts for 10~ 30%, suspended numbers for 5~ 20%, shutdown number for 5~10%. It means around 20~ 60% dialling numbers are invalid. With call classification function, dialling systems (predictive dialer) could filter out all invalid numbers for best dialling results. Reduce Operational Expenditure (OPEX) by 20%: Unsuccessful dialling incurs higher operational costs while labor cost for telemarketing is specifically considered. According to analytical statistics from surveys, OPEX could be reduced by 20% or more if successful dialling ratio increases by 60%. 99.999% Accuracy of Call Classification: With call classification functionality, over 99.999% of called number states could be accurately detected by analysing telephone alert tones. Only in much noise conditions over the network, call classification may default. High-efficiency Decoding & Encoding Function: With the popularity of IP communications, increasing need for transcoding between various protocols and coding formats becomes more important. Large-capacity VoIP applications call for high efficient transcoding functionality. High-efficiency decoding & encoding function can be offered by SR500. Completely non-blocking architecture and Scalable System. Easy integration with existing telephony interfaces. Open-standard SIP support and register to multiple SIP proxy servers. Make and receive IP calls from analog extensions. Call budgeting based on allocated amount, minutes and call count. Manageable based call routing TDP-IP/IP-TDM. Restrict unwanted calls with list of denied numbers. Real-time call record send to CDR server. Caller ID presentation and restriction. Consol access via Telnet, SSH. Designed for voice mail and unified messaging applications, SMG 1000 has a 10/100 Base-T Ethernet connection for connecting legacy PBX to a LAN. The analog loop start functionality supports integration via in-band signaling (DTMF or FSK) or serial protocols. The SMG1000 Gateways provide a simple, cost-effective transition to voice and data convergence for enterprises with PBXs. Connected externally, they offer an IP solution that works with current legacy equipment. They support SIP-based applications as well as T.38 for fax transmissions over IP (FoIP). 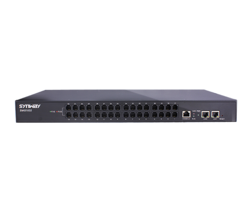 The SMG1000 Gateways can be used to connect IP telephones to a legacy PBX, integrate network-hosted applications with the PBX, extend the PBX to branch offices, and integrate various voice and call processing capabilities in an enterprise LAN or WAN environment. With exclusive PBX network interfaces, the SMG1000 gateway appliances provide exceptional IP to PBX integration capabilities to protect an investment in legacy telecom equipment. 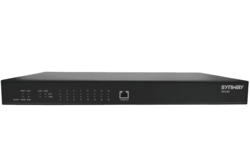 The SMG1000 Gateways route calls from the switched network to a VoIP destination on the IP network.Conversely, it routes calls from the IP network through a switch port to a destination telephone number on the switched network. The SMG3000 is a newly launched VoIP solution of Synway digital gateway family. 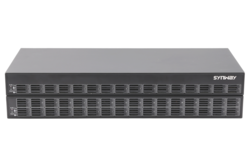 Designed especially for telco-grade applications, it processes signaling and media in a single chassis and can deliver SIP services into SS7, PRI and SIP networks.